Most encounters with artichokes only involve the hearts of the globe variety marinated in extra virgin olive oil or vegetable oil. These make for an interesting addition to a table of antipasti or chopped up and added as part of a robust pasta sauce.For the intrepid but inexperienced cook, the journey to the heart of the globe can be an intimidating one that only becomes easier through practice. But is should be regarded as a rite of passage. 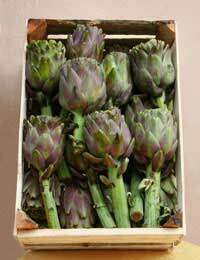 Much easier is the preparation of the other type of artichoke, the Jerusalem. The latter literally bears no relation to the former, being a tuber rather than a member of the thistle family, but more of that later. Let’s concentrate on the preparation of a globe artichoke. The first job is to wash thoroughly, then begin peeling away the woody outer leaves, snapping them off until you reach an inner core where the leaves are green only at the tip. Then slice off the top 3 centimetres of the artichoke to reveal an inner fibrous inedible layer, known as the choke that should be scooped out with a spoon to reveal the white of the heart that lies below. Turn the artichoke over, slice off 2 centimetres of the stem and pare away the outer green layers, leaving the whitish core. Once the tender leaves, heart and stem are prepared, rub them with lemon juice, otherwise exposure to the air will result in them turning black. If you wish to present the prepared artichokes whole at the table, stand them on the flat end in a deep casserole dish and pour in enough water to cover half of the body. Cover with the pan lid or a towel, and simmer on a low heat for around 40 minutes or until tender. Serve the vegetables at room temperature, stalk side up, with a dressing of one part extra virgin olive oil to three parts lemon juice and some freshly ground black pepper. The easiest way to tackle the cooked artichoke is to peel away the tender leaves manually, so guests may be glad of a finger bowl and a napkin. The Jerusalem artichoke has no connection with the Middle Eastern city of the same name. The knobbly tuber forms the edible part of the plant and the flower resembles a sunflower, or in Italian girasole. The corruption of the pronunciation of girasole to Jerusalem, according to food writer Marcella Hazan, may explain the mystery. Once you have the Jerusalem artichokes on the cutting board, what to do with them? Well, firstly, wash and peel as you would a potato. Then the flesh could be finally sliced, tossed in lemon juice to prevent discolouration, and added raw to a salad to provide a crisp, nutty texture. Alternatively bake with parmigiano reggiano, cream and grated nutmeg in a shallow casserole, combine with field mushrooms in an earthy soup, or shallow fry in extra virgin olive oil as an accompaniment to meat or fish.